Jake's Bones by Jake McGowan-Lowe. Review: Have you ever wondered how the skeletal system of an animal looks? Jake did; he began collecting bones in a small village in Scotland. When he was 8 years old, he developed an interest in collecting bones. In Jake's bonesJake collects all kinds of bones from a leopard to an alligator. 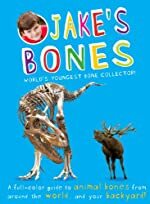 Jake will teach readers all about his incredible collection of bones with his cool skeletons, including Oscar the hedgehog, Vulpie the fox, and George the deer. Readers will also learn specific bone parts, teeth, and antlers. Furthermore, readers will travel back in time and discover unique dinosaur bones as well as uncover weird bones that you didn't know existed! Be amazed by the biggest, smallest, and most bizarre bones on Earth! If you are interested in bones and want to know more, then Jake's Bones by Ticktock is the perfect fit for you! I recommend this book for kids ages 10-12 because of the length, words choice, and good detailed facts used in this book. There is plenty of information, interesting details, and facts a young paleontologist can possibly ask for. Jake has information for all animals big and small. If you're a student and you have a report on bones, then Jake's Bones is a great, reliable source. We would like to thank Ticktock for providing a copy of Jake's Bones for this review. Have you read Jake's Bones? How would you rate it?